Population Growth in Egypt: More People, More Problems? This piece is the first of two that look at Egypt’s demographic situation and how it affects the country. Here, Dr. Ahmed Wagih discusses the background details and addresses some of the problems already facing the Egyptian government. A future piece will present some potential steps that governments to come could take in response to the challenges presented by Egypt’s growing population. The statement read by General Abu Bakr al-Gindi, head of the Central Agency for Public Mobilization and Statistics (CAPMAS; Egypt’s equivalent of the U.S. Census Bureau), on March 24, 2014 revealed many worrying facts regarding Egypt’s demographic future. The Egyptian population has been growing at unsustainable rates for decades, but 2013 was a year of record growth, with the number of births reaching 2.6 million (compared to about 0.5 million deaths). This population boom comes at a time when the Egyptian government has struggled to provide even basic government services, and the authorities seem unprepared to deal with the additional stressors that emerge from the accelerating population growth rate seen in the country..
Common sense (and planning theory) tells us that there needs to be a balance between the providers of any service and the number of people benefiting from that service in order for there to be an acceptable level of performance. In Egypt, this balance has long been missing. The population boom that has overwhelmed the system results from improvement in medical care at both ends of the life spectrum—according to World Bank data, infant mortality has fallen from 113 per 1,000 births in 1980 to 17.9 per 1,000 in 2012, and life expectancy has grown from 48 years in 1960 to 71 in 2012. The boom is not yet over, either—Egypt’s current fertility rate of 2.87 children per woman (calculated in 2014), while not among the highest in the world, is still well above the world average of 2.45 (calculated in 2013). To provide some further context against which we can appreciate the rate of population growth in Egypt, it is enough to examine the figure below, which illustrates graphically the population growth of some select countries in terms of the ratio between their respective populations in the years 2013, 2000, and 1950. In the graph, it is clear how Egypt has fared in comparison to these countries: while all grew considerably between 1950 and 2000, growth rates for most markedly declined over the next 13 years. 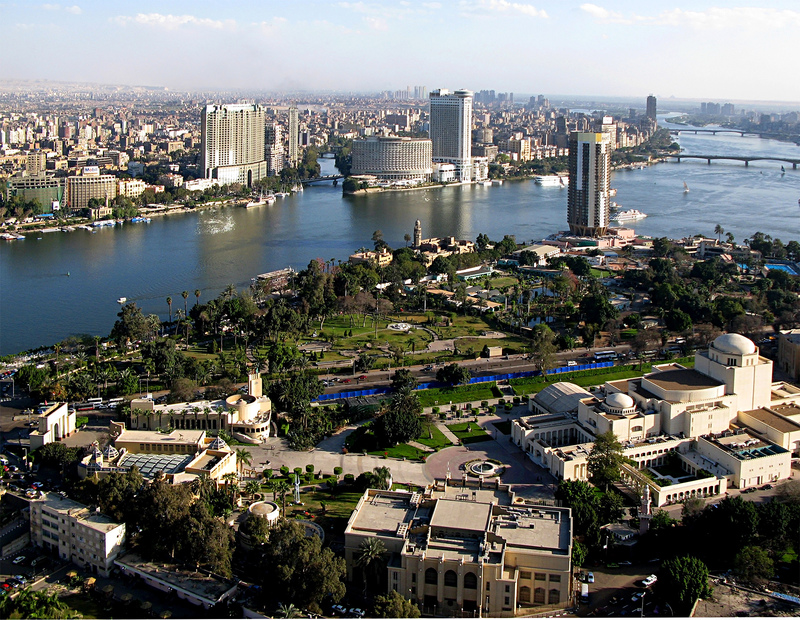 Egypt’s fourfold growth since 1950 tops the pack, with Turkey coming in with the second-highest overall growth; of course, Turkey has an abundant supply of water and agricultural/pasture land compared to the mostly desert landscape of Egypt. Demographic concerns in Egypt do not only lie in the size of the population; the composition of the population is also important. One of the most economically prominent countries in the world today is South Korea, which managed to create a world-class economy in a relatively short period of time. Egypt and South Korea had roughly the same population in early 1960s, yet today, Egypt’s population of 86 million is almost 75% larger than South Korea’s 49 million. A quick look at the two countries’ population pyramids in the figure below reveals the tremendous differences between them. The highest percentages in the case of South Korea are in the currently productive categories, whereas the highest percentages in the case of Egypt are at the bottom, outside of the currently productive age groups. Clearly, South Korea was able to harness an earlier large expansion of its population in a productive manner, which then helped to reduce its overall growth rate—this is the challenge that Egypt faces today. Putting aside the question of simply sustaining its vast population, Egypt faces additional difficulties in promoting its people’s economic productivity. The argument that has been championed for quite some time—sometimes by prominent public figures—is that Egypt’s population is a resource in itself that, if managed properly, can generate wealth and promote broad development. While this argument has the theory right, it faces tremendous hurdles in moving from theory to real-world application. As one example, the public education system in Egypt today is under severe stress due to the continual high rate of growth in the school-age population. Classroom densities in excess of 100 students per class are common, and studies have found that significant percentages of eighth-grade students cannot read or write properly. In addition to these problems among younger students, there is also a distribution problem among older students: hundreds of thousands are crammed into a university system that produces far too many graduates who have difficulty finding jobs due to having had either an insufficiently rigorous education or an education in a field that is not demanded in the labor market. While factories in Suez are asking for government authorization to import technicians from abroad, tens of thousands of Commerce, Law, and Arts graduates are mostly sipping tea in Cairo coffee shops or taking petty jobs that do not require their university degrees. This is the opposite of the problem presented by the continued overcrowding of university programs that are in high demand in the labor market: one example is the department of Urban & Regional Planning at Cairo University, which has been forced to accept 250 students per year instead of its initial design capacity of 100 students. Medicine, Engineering, Pharmacy, and other departments have also been subjected to similar measures to accommodate more students, and these forced increases in enrollments are not met with an equal increase of resources. Consequently, the quality of graduates in these fields has deteriorated. Unfortunately, the challenge for Egypt does not stop with improving the educational system and aligning students with job opportunities—more basic concerns are present, including security and simply providing for the population’s basic needs. For example, anyone who has studied planning knows that one of the initial parameters needed before planning any space is the Holding Capacity (HC), which is based on the availability of basic resources. If we apply the international water poverty line—set by the United Nations at 1,000 m3—as the main parameter to determine Egypt’s HC, we reach the conclusion that Egypt will be challenged, in the long run, to appropriately provide for more than 58 million people (based on an annual water income of around 58 billion m3). Ultimately, Egypt needs to move away from piecemeal efforts to deal with the current and future concerns that emerge from its demographic realities. This will require cooperation between the authorities governing the health care system, the educational system, industry, housing, transportation, agriculture, and more. In short, solving Egypt’s demographic dilemma will require a government that can come together to enact a cohesive, multi-departmental plan of action. We can only hope that the next government proves up to the task.